Note: For this review, Withings kindly provided me with the Withings Body Cardio, which I am to return after testing. This has allowed me to fully test all the features and put the scales through its paces so I can give the best informed review possible. 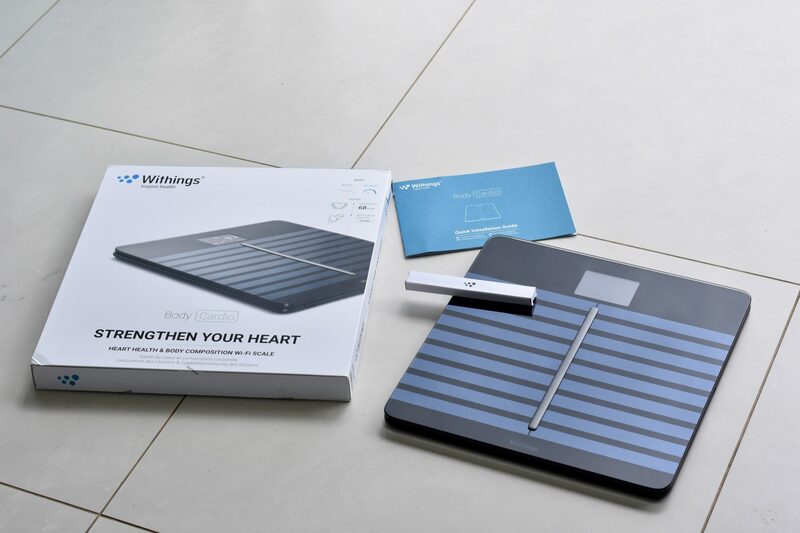 Traditionally, scales are a simple device which have the ability to give an accurate reading of a given weight, yet Withings have taken this simple invention and brought it into the 21st century with the Withings Body Cardio scales. The Body Cardio scales are more than just a weight measuring device; they monitor and track overall health, paying special attention to the heart. Withings are revolutionary pioneers when it comes to making devices which sport the ability to give metrics which were previously only available to professional practitioners. This is inherent throughout the Withings Body Cardio which measures Pulse Wave Velocity and in-depth Body Composition metrics. All of which is synced instantly and wirelessly through the Withings Health Mate app, allowing a seamless transition between recording data and analysing data. As with other Withings products, the packaging is sleek and simple. Upon sliding off the outer sleeve, a pure white minimalist box presents the Withings Body Cardio, accompanied by the charging cable and quick start guide. The Withings Body Cardio is a fully Wi-Fi enabled smart scale. This allows it to sync and be connected to the partnering Withings Health Mate smartphone application. It is on this application that all data and body metrics which are recorded on the Body Cardio are viewed and analysed. To do this, set up a profile via the app, inputting data such as height and weight as accurately as possible. Once this is completed, the scales can be paired with the app which will be done automatically over Wi-Fi. Fresh out of the box, the Body Cardio will already have some charge allowing measurements to be taken straight away. Therefore, the set up process is practically instant! With the app downloaded and a profile created, just step onto the scales and it is good to go. With multiple profiles being possible on Withings Health Mate, the clever thing about the Withings Body Cardio is that it will be able to instantly differentiate between users just by weight. As the user steps on to the scale, it will display the name of that user in the upper left corner once the weight has been determined. Traditionally, scales have four feet on which it stands. 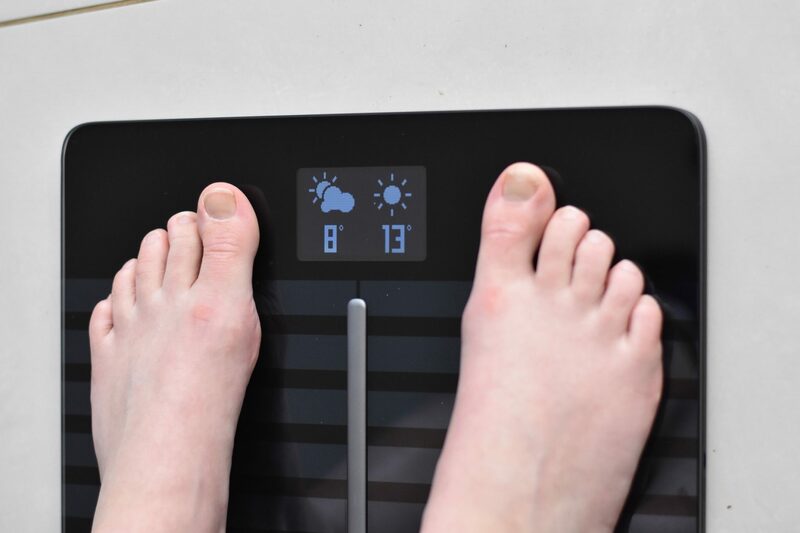 When the user steps onto the scale, the strain gauges in the feet deflect a given amount depending on the load. The extent to which these gauges deflect therefore converts into a weight reading. For this to be possible, this type of scale would have to be situated on a hard surface so not to have any dampening effects to the strain gauges inside. If the feet were to be on a soft surface (i.e. carpet) then the material underneath would also deflect under the load, reducing the perceived change in load applied to the scale. However, Withings are looking to put this in the past and are leading a new trend by introducing the Withings Body Cardio as a footless scale. This revolutionary design combats the seemingly outdated design and issue of the four feet scales, allowing the Body Cardio to make readings on both hard and soft surfaces, including carpet; breaching to new possibilities for where the scales can be used, eradicating limitations imposed by floor surface. The innovations of the Body Cardio continue on the inside. Market leading innovations of Body Composition analysis is helped by full length electrodes which run under the seamless, unhindered pane of glass which sits as the main surface. 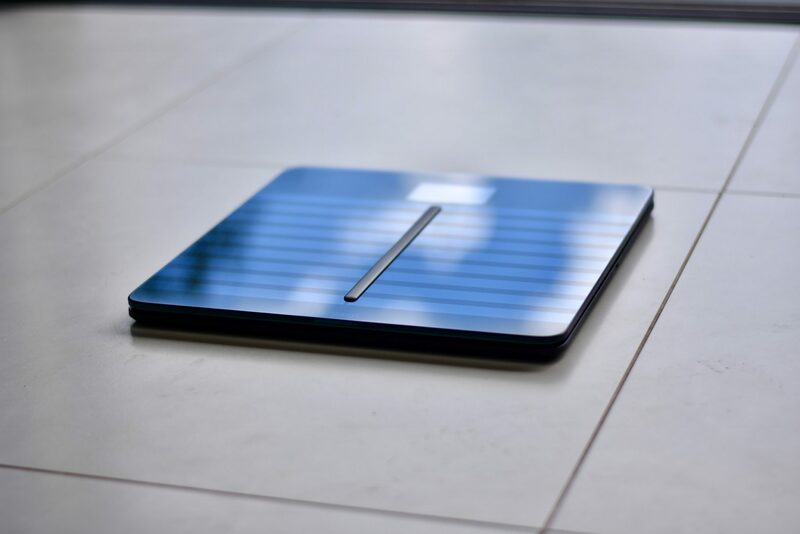 Along with a bright LED screen giving instant feedback and hidden electrodes within, Withings have done an incredible job in making this rechargeable scale so slim. Despite being surprisingly heavy, it adds to the inherent durability and quality of the product’s manufacture. Other than the heavily advertised, fancy features of Body Composition and Pulse Wave Velocity, the Withings Body Cardio remains an unmistakably competent weighing scale. When looking at a weighing scale, the obvious question posed to the customer is the accuracy of the weight reading given. 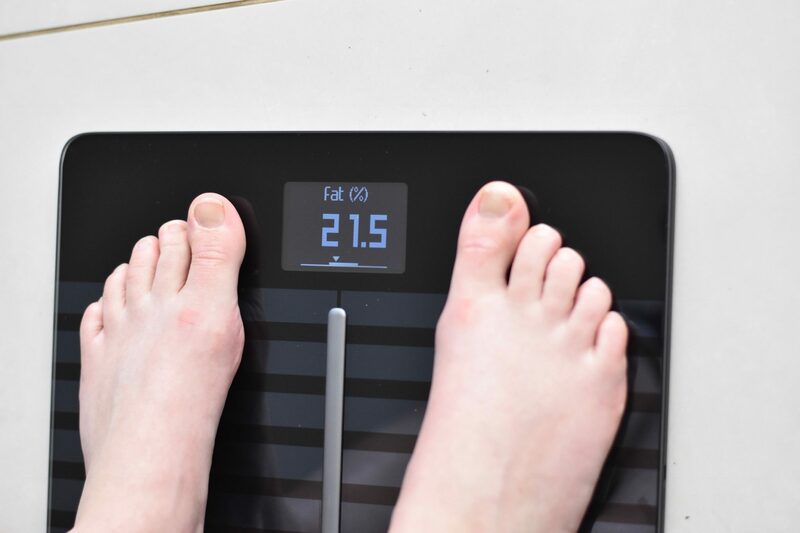 Fortunately, this value is fairly easy to obtain and given recent technological advancements, it is likely rare to find a scale which doesn’t provide a reading that can be trusted. This is no different with the Withings Body Cardio, and with this being the case, weight is the first reading given by the Withings Body Cardio before automatically scrolling through the various other metrics provided. 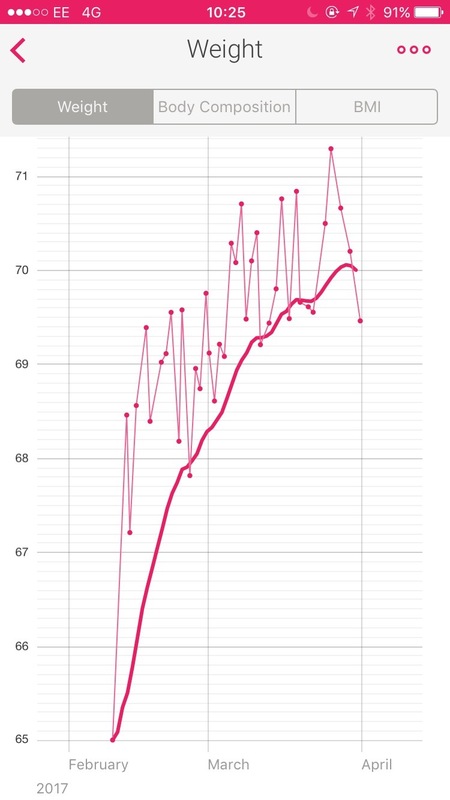 I have weighed myself every day over the past month, seeing daily fluctuations which were to be expected, but also no wild data points which didn’t corroborate with previous measurements. When cross referencing values against other scales, I was happily given near identical weights which differed by no more than 0.1kg, being a mere 0.15% error across the two scales: a more than adequate and accurate results. After all, this is primarily a weighing scale with some hyped up extra features, but this is to be expected from a modern day scale. Don’t get me wrong though, these new features are not gimmicks. They contribute equally to the interaction between the app, the scales and the user, allowing for an all round comprehensive body analysis, all whilst getting the weather along the way. Yes, with the inclusion of Wi-Fi, the Withings Body Cardio is actually able to pull current weather data from the connected smartphone, displaying this live on the Body Cardio’s screen all whilst a weight reading is being taken. A cool addition, but not something I would deem a necessity to a weighing scale or neither a USP that Withings needs for the Body Cardio given its Pulse Wave Velocity capabilities. 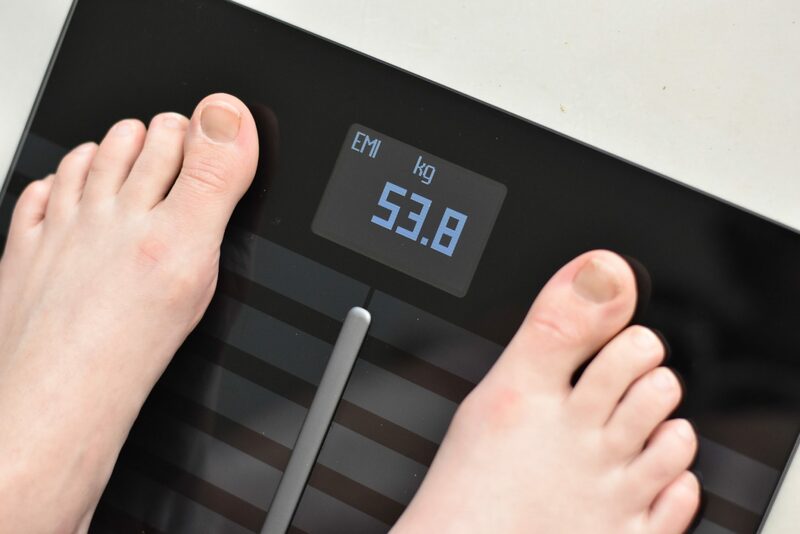 Over my time writing reviews and looking at various fitness products, I have started encountering Body Composition more and more as it makes its way into mainstream consumer technology. What was initially a high end, medically conducted review has now become a readily available measure that can be done at a simple step onto the scales or touch to the wrist. However, these reviews and testing have continued to leave me skeptical of the accuracy of the readings. With only two points of contact to electrodes rather than the four found on higher end Tanita machines, it is inevitable for accuracy to suffer as the electrical current against the resistance of body fat only travels through half the body. Despite this initial skepticism to the new technology, I had a confident, open mind when looking at the Body Cardio. Obviously no reading is to be perfect with generic algorithms looking to make educated estimates of the electrical data, but for me, I was more interested in looking at how closely aligned various measures of Body Composition were. As with all body composition measurements, there has to be at least two points of contact with electrodes, one being the anode and the other the cathode. In the case of the Withings Body Cardio, these two contacts are both feet, therefore any readings must be taken bare foot. Note: Be careful not to confuse the cumulative percentages. If all four data points were added, it would make 100% + (Body water %) = 165% ish. This is because the percentage values are the percentage of the total solid material (fat, muscle, bone) or liquid material (water and blood). 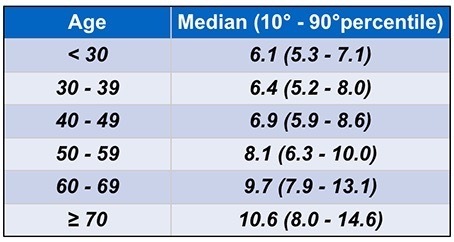 Therefore body Fat % is: ((body fat)/ (body fat + muscle mass + bone mass)) * 100. When looking at the accuracy of the Body Composition data given by the Withings Body Cardio, I would look at data taken from a number of devices. The Tanita Body Composition machine; the TomTom Touch – the latest wearable from TomTom – and a generic (and quite old) scales/ Body Composition machine found in Boots. Given the expertise and reputation of the Tanita – along with the advanced body measurement technique using four separate electrodes – this would be the baseline and most trusted reading when looking at Body Composition. Whereas, the TomTom Touch only gives a Body Fat % value which I found to be questionable to say the least so this will only be used for a comparative basis. 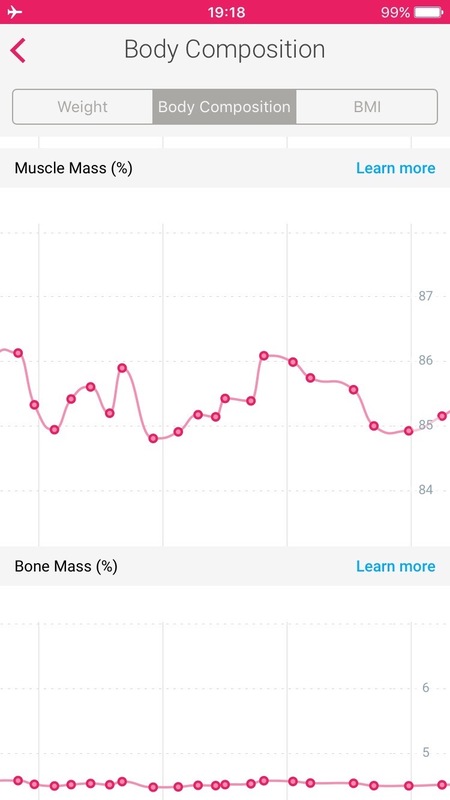 Over multiple measurements of my body fat, muscle mass and bone mass, the readings have fluctuated over the month or so period during which I was testing the Withings Body Cardio. What was most encouraging was the way in which the body fat and muscle mass values varied in near direct correlation to one another. As one fell, the other would rise showing one to seemingly become the other as my diet and exercise varied over time. 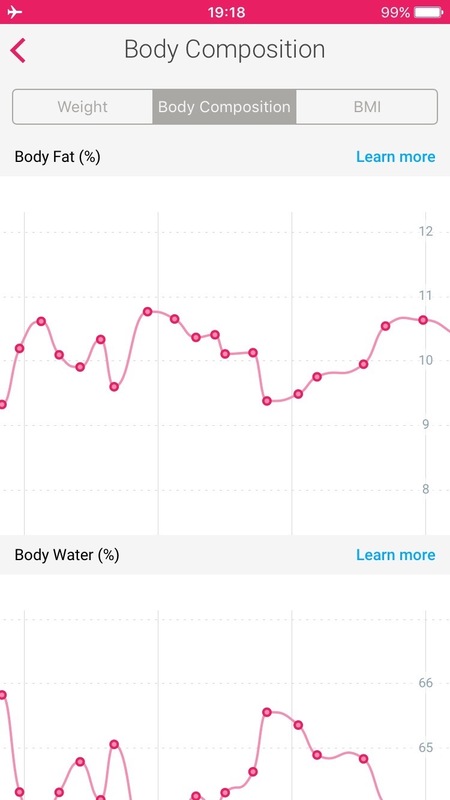 Looking at body fat percentage specifically, I would take a reading off the scales once a day almost every day over the month (46 readings), collating the data on Withings Health Mate. These data points would give an average body fat percentage of 9.82%. I personally would take this to be rather accurate given the two electrode connection points. 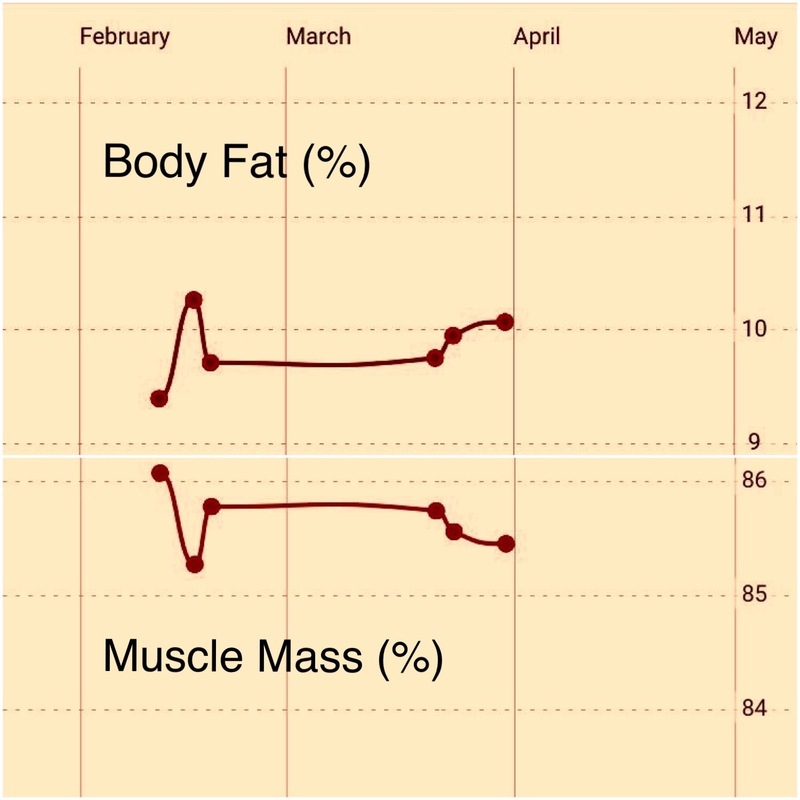 The Tanita machine gave a reading of 7.4% which, while taken a few months back now is not too far from the same value, especially given as some factors may of changed like my weight increasing; therefore implying an increase in body fat. Withings also accommodate multiple profiles to be set up on the Health Mate app, this allows the whole family to use the Body Cardio, all gaining the benefits of body composition data. This allowed me to also test the scales on a friend who also had current readings given by a machine from a Boots store, although the quality and accuracy of this machine could not be confirmed. This variance of 6.0% between the two is not hugely worrying due to the Boots machine being very old so therefore would be like comparing the TomTom Touch to the Body Cardio. The main point to take from these readings is that it is not wildly out of the expected range (for example, the TomTom Touch gave a value at least double that of the Tanita). These advancements in technology are also fast that companies jump to implement them into their latest products so not to fall behind in a race of innovation. However, it sometimes leads to a slight lack of quality or accuracy in the case of measured data. But again, Withings have shown to be one step ahead with strongly correlating, accurate data to a degree that is close enough for the average user not to have to worry about. I won’t go into further detail regarding the muscle mass % and bone mass % as they similarly accurate as the body fat % showed to be. Finally, the Body Water % is a reading which I am not able to comment definitively upon due to lacking any means of comparison. However, I highly doubt many users will strongly analyse this metric and use it to any extent when changing their lifestyle, unlike the body fat % reading may do so. 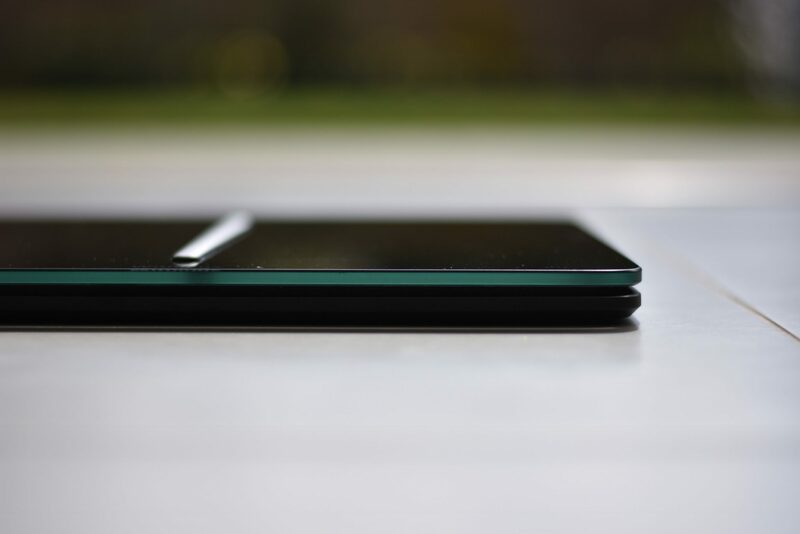 With the rest of the review complete up to this point, I am now able to focus upon the biggest talking point surrounding the Withings Body Cardio. Pulse Wave Velocity. What is Pulse Wave Velocity? In-Short: The velocity with which the blood exists the heart through the aorta. In-Depth: As the name suggests, this is a measurement of Velocity (meters per second, m/s). It is the measurement of the speed at which the Aorta (the largest bodily blood vessel, transferring blood from the left ventricle to the rest of the body) pumps blood out of the heart. It is measured for each pulse of the heart and this is periodic motion which forms a wave, therefore a Pulse Wave Velocity is given. Why is Pulse Wave Velocity important? In-Short: It predicts and provides evidence for life threatening heart conditions. In-Depth: The velocity with which the blood leaves the aorta is in direct correlation with the stiffness of the aorta. This means that the stiffer the aorta, the faster the blood leaves the heart (higher velocity). This increase in stiffness comes with age but is deemed a bad thing to be the case in younger people as it a ‘highly reliable prognostic parameter for cardiovascular morbidity’ (datasci.com), being able to detect early signs of heart disease, strokes and dementia. How is Pulse Wave Velocity measured? In-Depth: Not only are there electrodes under the surface of the glass plate of the Withings Body Cardio, but there are also two ‘catheters’ a known distance apart. When a Pulse Wave occurs from the heart, the time taken for it to travel between the two catheters is measured and used with the distance to calculate the Pulse Wave Velocity. 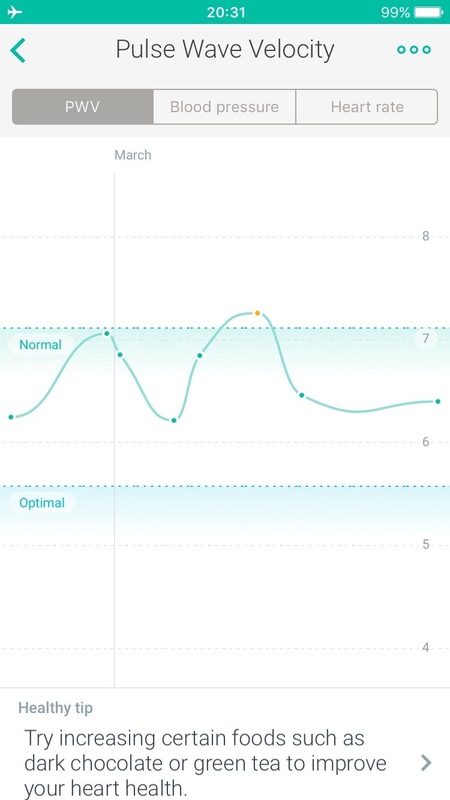 Now, with all the science out of the way, I can look at how it works on the Withings Body Cardio. The first thing to note with the Body Cardio is that it won’t give an instant measurement with the first step on the scales. 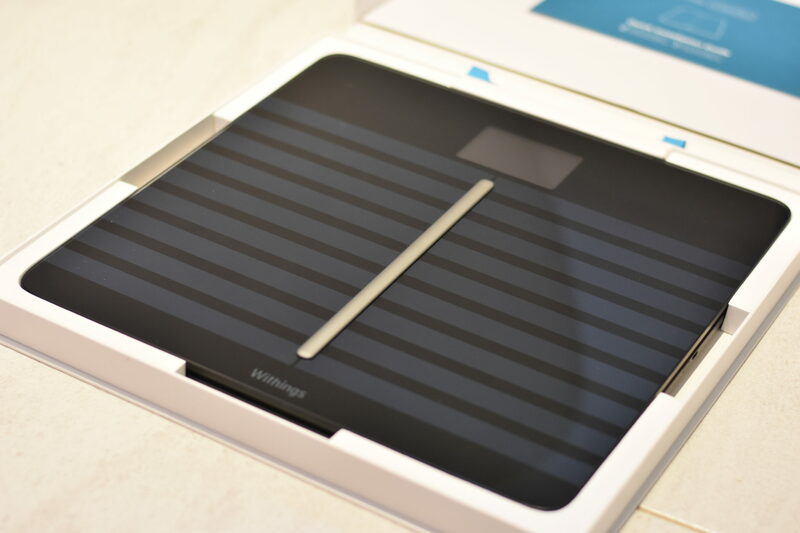 It takes five days of continuous ‘weigh ins’ as such before Withings is able to provide a value; again that is five days in a row rather than just five separate weigh ins. 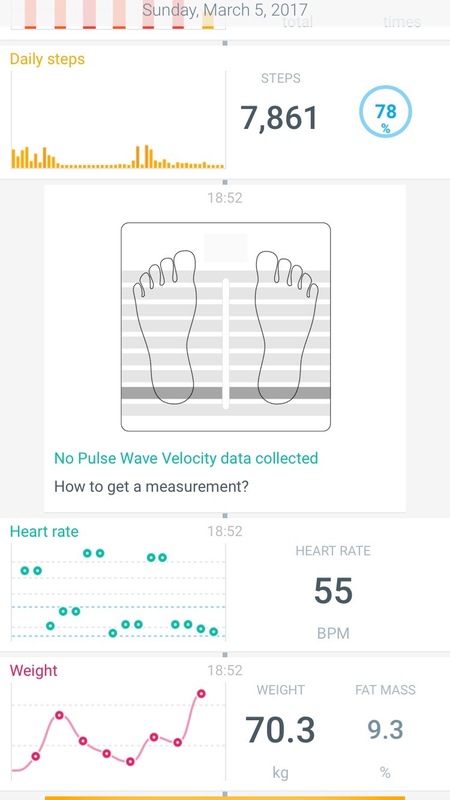 The other important thing to note with the make up of the Withings Body Cardio when measuring Pulse Wave Velocity is that catheters don’t run the full length of the scale. Withings advice stepping on the scales with the heal of the foot placed level with the second division line from the back. This leads me to an unfortunate point to have to make yet slightly understandable issue with the Withings Body Cardio. I found throughout all my testing that likelihood of gaining a Pulse Wave Velocity reading from the scales was often very low – maybe as low as about 1 in 8 times. The Body Cardio also provides a heart rate value to accompany the PWV reading and this was equally scarce. It wasn’t like I didn’t gain these values, they just happened to more often than not fail to appear. I do find this understandable though as a value such as the Pulse Wave Velocity is a very precise measure that has to detect echoing waves from the blood – no mean feet whatsoever. Measuring this and heart rate through the feet, where the skin is at its thickest only makes this harder. 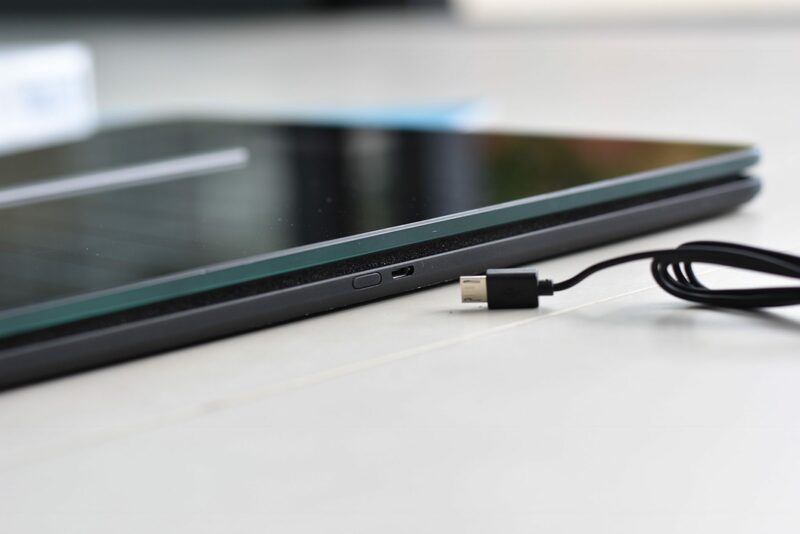 Given time and development of sensors to improve sensitivity levels whilst also eradicating noise levels will not only improve the consistency of readings but also accuracy. Unfortunately, I have not been able to personally cross reference the results given by the Withings Body Cardio as there are few other consumer devices that are capable of this metric. A review of this product also couldn’t justify the precious time of the ever strained U.K. Health service, so for now results should be taken with a pinch of salt. 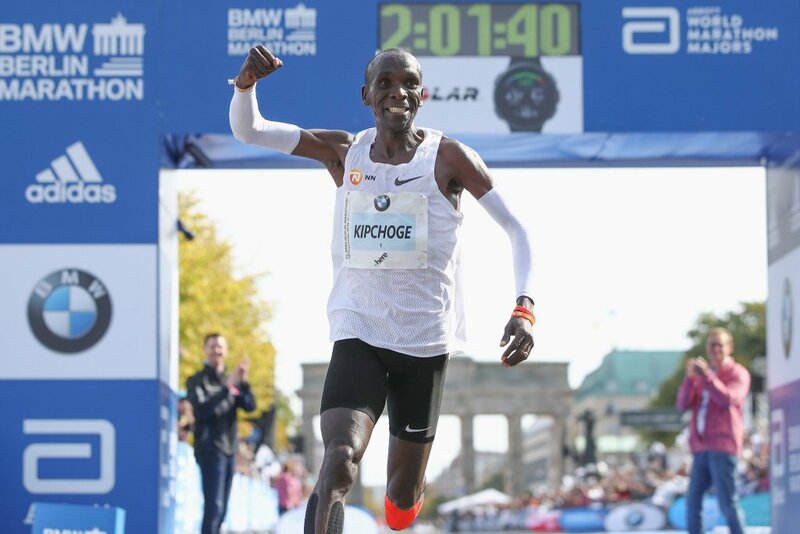 The results should also be taken with the confidence that the Body Cardio would have undergone strenuous medical testing to warrant general release. I saw steady values which wavered slightly from the mean over the course of over a month, without any wild anomalies. 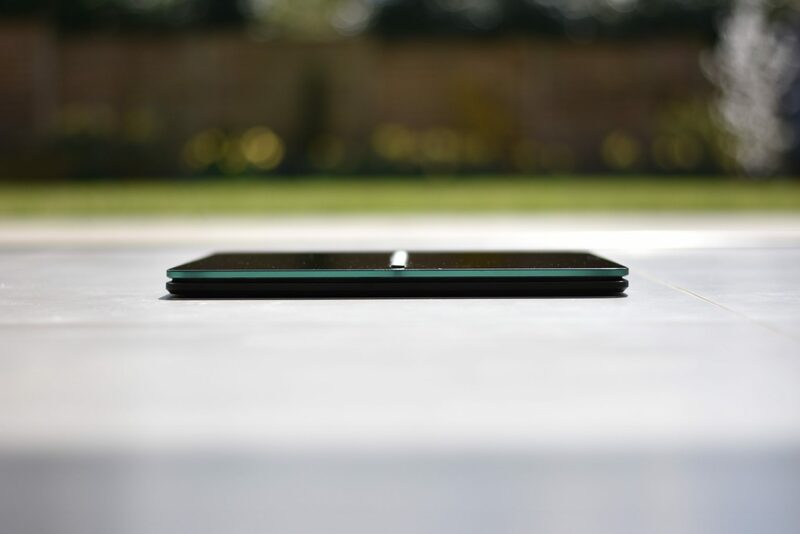 The Withings Body Cardio is undoubtedly the most powerful and leading scale on the market. With an abundance of smart features allowing instant data analyses via the Withings Health Mate app along with revolutionary new metrics, previously never before imagined, makes this the must have scale for those both tech and fitness savvy. Other than the slight disappointment regarding the frequency of PWV values given, the Body Cardio never put a foot wrong. 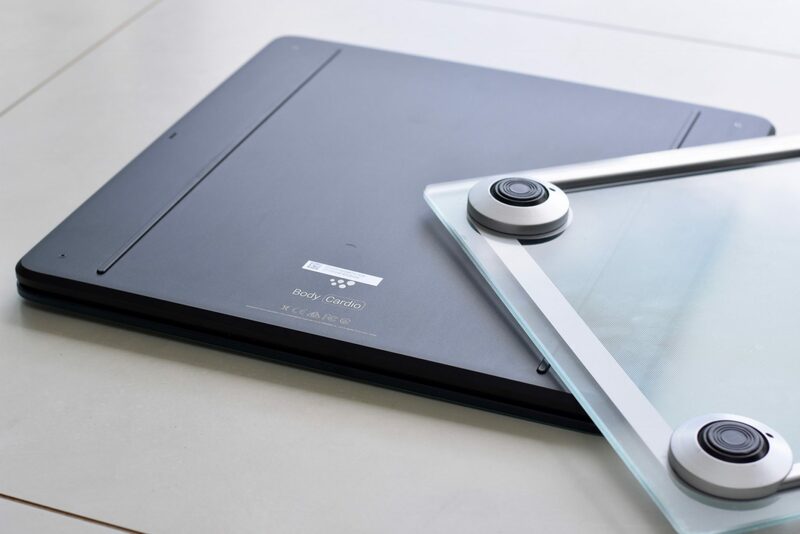 Being an impressively sleek and robust design whilst also having the ability to transfer from one surface to another shows how far the scales industry has come. It is now possible to measure heart rate, body fat percentage, Pulse Wave Velocity, weight and see the weather all on one device, showing Withings to have done a great job with the Body Cardio. The Withings Body Cardio is available from their website here.